Please click here to download our IPSSL preliminary data sheet. The first product to be launched is IPSSL-Ne (640.22nm). Other devices currently under consideration for manufacture are given in the table below. IPSSL technology addresses needs in industrial markets for light sources. One major application is optical pumps. By matching the embedded atomic resonant standard of the IPSSL to the atomic resonance of the absorbing pump medium, high conversion of optical pump energy can be achieved. An example is the use of IPSSL-Rb to pump the rubidium D2 transition of a DPAL laser. Another major application is chemical analytical instrumentation requiring high wavelength accuracy and stability. Multivariate chemometric tools require accuracy at 0.005 nm. 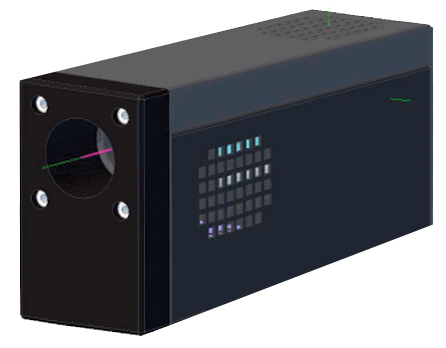 As Raman spectrometers, for example, rely on conventional semiconductor lasers, wavelength accuracy is no better than about 0.5 nm. In addition, systematic errors are also introduced by the transfer function of the spectrograph, including the grating, CCD structure, and opto-mechanical and opto-thermal properties. Although these systematic errors are correctable, calibration of the spectrograph alone is not sufficient without a stable laser. These circumstances generally demand frequent and periodic wavelength calibration. When integrated into such instrumentation, IPSSL provides an invariant wavelength reference point. This eliminates an important variable in the chemometric algorithm with positive implications for system simplification and operating cost reduction. For instrument manufacturers, reproducibility from instrument to instrument is assured, and the simplicity of the design integration can eliminate moving parts. In the future, more advanced multi-wavelength IPSSL technology will provide a Fellgett advantage for shifted excitation Raman difference spectroscopy (SERDS). IPSSL technology is also attractive for scientific markets. Examples include Bose Einstein condensates (“atomtronics”), advanced cleaning processes for semiconductor wafers and photolithographic masks, and optical magnetization of Xe and He for MRI lung diagnostics. IPSSL technology also offers advantages for LIDAR and atomic clocks.